It’s that time of year when the focus is warming soups, comfort food, planning for Christmas and snuggling up in front of the fire. It might feel like a bit early for us to mention Easter, but some of our most popular sites are already sold out, so while you’re curled up on the sofa, take the time to research your next trip. Spring is a lovely time of year to get away and we have some great value offers and discounts on some of our top resorts. So have a browse and begin the holiday countdown here. 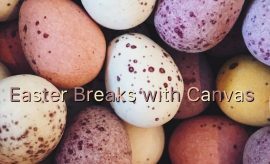 Easter can be a great time to take the kids away, the temperatures are considerably higher than the UK, but it’s not too hot for everyone to be out and about in the fresh air. It’s a fantastic time for family day trips and getting active as a family. Visit some of the local landmarks or hire bikes and get exploring some of the local trails. And if Easter means family to you, why not travel as a group with grandparents, cousins, aunts and uncles too. Give us a call and can make arrangements for you. Camping Fabulous is an attractive campsite set between the city of Rome and the coast at Ostia in Lazio’s national park. This is an excellent location for a lively family holiday – with plenty of activities to keep everyone amused. The ancient city of Rome is easily accessible by public transport, and there is a long, sandy beach just a short drive away. Easter OFFER from £215.60 per week in a self-catering mobile home. Camping la Grande Métairie has been a Canvas favourite for more than 40 years. Set in the parkland grounds of a Breton manor house, this beautifully maintained site has been awarded five red tents by Michelin and has a lovely sandy beach nearby. The fabulous pool complex has a covered pool, two outdoor pools, five water slides and a jacuzzi. Children can meet some local farm animals at the adjacent mini farm and ranch. Fly to Lorient 34 miles, Rennes 85 miles, Nantes 89 miles or Ferry to St Malo. Easter OFFER from £249.90 per week in a self-catering mobile home. A friendly and lively, family resort set in one of the most beautiful parts of Italy. Set on the lakeside with access to the lakeside beach and stunning mountain view. There are five large outdoor pools onsite. The whole family will enjoy a day out at Parco Natura Viva, a safari park that is home to 250 different species of animals. Caneva World is an excellent theme park in nearby Lazise. La Pinède is a superb campsite packed with lots of activities for all the family. It’s set in a forest, just a short drive to the sparkling beaches of Royan. The jewel in the crown at La Pinède is the newly renovated water park. It features five slides, two swimming pools, lazy river, paddling pool and indoor heated swimming pool. Young children will have a great time meeting alpacas, goats and other animals at the mini farm. To browse all our great Easter Offers have a look here.